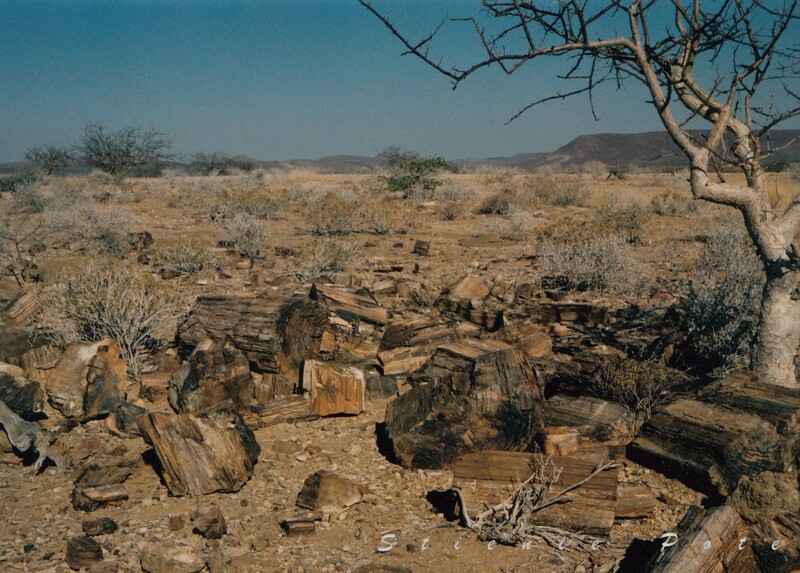 The Petrified forest located some 40 kilometres west of the Namibian town of Khorixas, on the C39 road, is a deposit of large tree trunks that have "turned to stone" through a process of diagenesis. There at least two large tree trunks exposed to view and more may be out of sight. The site was declared a National Monument on 1 March 1950. It is believed that the trees were swept downstream by a large flood and covered by alluvial sands. Deprived of air, the organic matter could not rot and decay, but instead, over millions of years, underwent silicification, whereby each cell is individually fossilised and the appearance, if not the colour, of wood is retained. The surrounding sands became sandstone, which is now eroding away. In addition, there are a large number of welwitschia plants at the site. Public access is by guided tour only. There are toilet and refreshment facilities.